Your comments were so fun on my last post! I loved reading about how we're all connected. Thanks for playing. We've been really bored today, so here are some pictures we've taken. 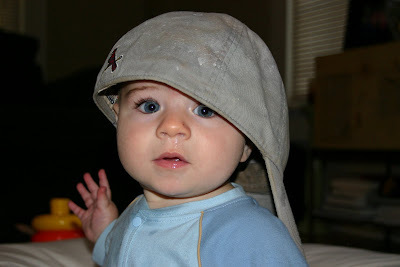 Jackson randomly put on his daddy's hat. If you enlarge these, you'll get to see the encrusted ketchup on his face. Annabeth posed with Beckham. (This was not random. Totally staged.) I trust no dog fully, but Beckham is so sweet with the kids. He didn't move a millimeter and barely breathed because he knew the baby was up against him. 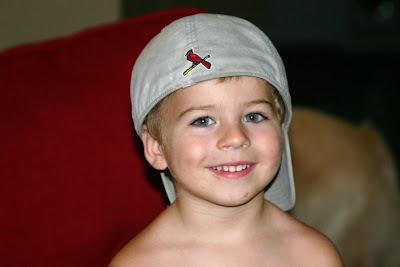 I knew we had one of Jackson like this at about the same age, so I looked through my pictures and found it. Look what else I happened to find, too. I didn't even realize we had this. I've been wanting to do a post like this for a long time and today is the day! Just for fun, here are some questions. Do we know each other? If so, how? EX: Yes, I was one of your bridesmaids, you dork! EX: We went to junior high church camp together. Remember when you used to wear plastic shorts with bikers underneath? And baggy tank tops? In neon colors? EX: Yes, we were Rec Divas in 2000. EX: Yes, are you trying to guilt trip your friends into leaving you comments? Maybe we don't really know each other, but have we ever met? EX: Yes, we met briefly in the mall one time. You were on your way to get your highlights done. Bless your heart, you had a 6 inch black stripe down the middle of your head. 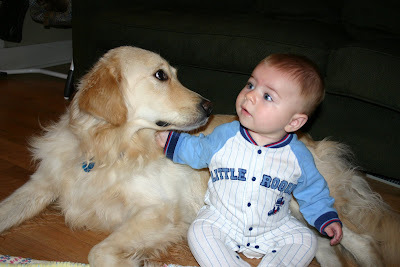 Do we have a mutual friend or acquaintance? EX: I'm friends with your old roommate. EX: I'm your sister's ex-boyfriend's sister. If the answer is no to all three, do we have something in common? 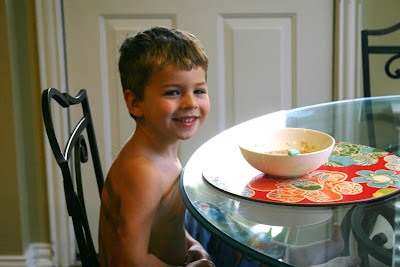 EX: Yes, I have a little boy who likes to be nekked all the time, too! EX: Yes, I was in Phi Lamb. EX: Yes, I have also been known to buy the same shirt from Banana Republic in two colors and immediately regret it when I don't like how they look after the wash. Dern, dern, triple dern! EX: Yes, I wanted to be Barbara Walters, too, until I read her autobiography which was TMI. I just thought it would be cool to know how we're connected. If our only connection is that you visit this blog every now and then, you're still totally welcome here. And no need to feel bad if you've never commented before. I have certain blogs that I comment on every time and others that I never do. And sometimes it just depends on whether I'm nursing the baby and can only type with one hand. You never know! Guess who's a big girl now? 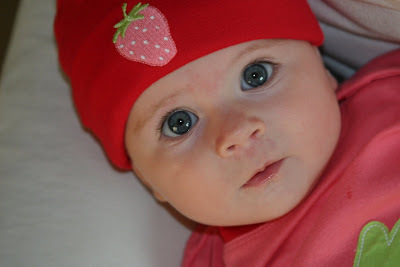 Annabeth Ellen Jones is, in her five-month-old splendor. 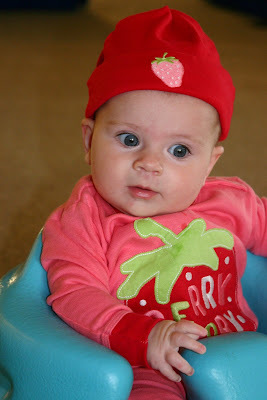 Five months is such a cute age. This is when they get necks. This is when they're big enough to tickle, to toss in the air, to play horsey on the knee, to sit on your hip, to face forward in the Baby Bjorn, to nearly break your arm in the baby carrier, try to sit up, to do baby push ups, and to nearly swallow their fists. But they're still basically immobile, to the praise and glory of God. 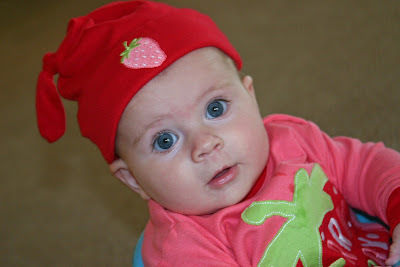 We've had a lot of fun with Annabeth this month. We've also had the most tears since the newborn days. 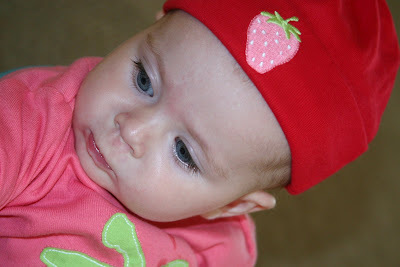 We have nothing to show for it yet, but Annabeth has been teething. Yeah, not my favorite. Baby's in pain, baby's fussing, mommy's frustrated with baby who doesn't want to nurse, mommy and daddy are wondering if their sweet, chilled out baby is gone forever. (I don't think she is.) I'm checking her gums every day but there's no change. I know from going back through my very old posts that Jackson teethed all summer and didn't get his first tooth until September. That was stinkalicious. 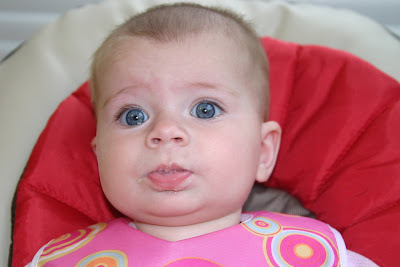 Well, why is Annabeth such a big girl now? She got to try this today! 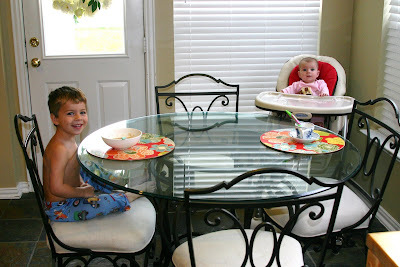 Everyone is ready for breakfast. 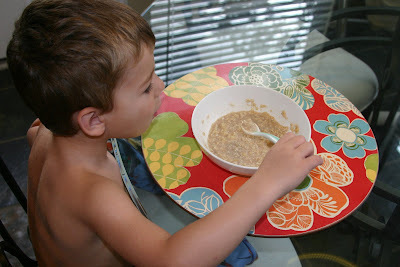 Jackson and I also had oatmeal in Annabeth's honor. Jackson likes apple cinnamon and I like maple and brown sugar, to which I add raisins. Yum. This facial expression just about sums him up. 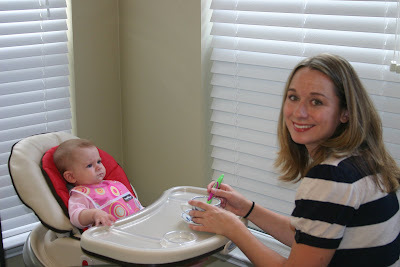 When I got out Annabeth's baby spoon, Jackson was very interested in it. Jealous, really. I dug out an old one of his and let him see it. And eat with it. Hmmmm. Mommy is dressed with makeup on at 8 in the morning. There are cameras everywhere. I'm in my sweet new chair. Something is up. Jackson thought I was giving Annabeth tea with a spoon. 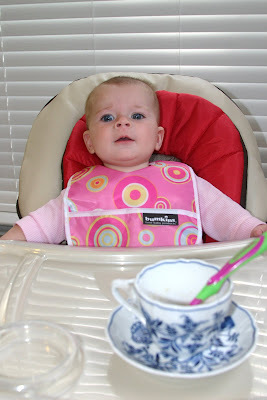 Tea oatmeal, Mommy? She wasn't real sure about what was in it. She didn't cry or whine, but her eyes started to tear up. So tragic! Look at that expression. I've not seen that face very often. 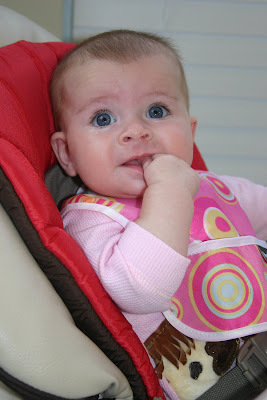 I think Annabeth's feelings would be best summed up in a monologue from...well, a portrait taken by Mom. 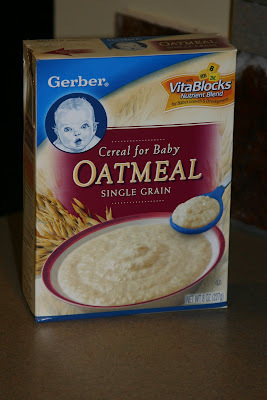 NOT REAL SURE ABOUT THIS OATMEAL STUFF. I have to add one last thing. Yesterday morning I realized we were at the end of Annabeth's relatively mild diapers. 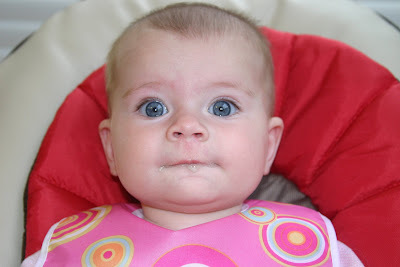 Breastfed babies' poo is generally not lethal until you start solids. It has a weird sweet smell that you can't compare to anything. I even thought about how sad it was that I might never smell it again. (Working the nursery doesn't count.) 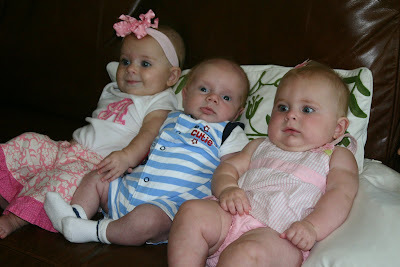 Maybe I will when I change my grandbabies' diapers one day, but they might not be breastfed. 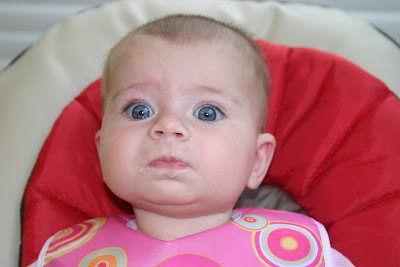 Wouldn't it be awesome if I pressured my daughter, better yet my future daughter-in-law, to breastfeed because I secretly wanted to smell breastmilk poop again? Did I just type that? People, this is what motherhood has driven me to. Later on I went to fetch Annabeth out of her crib after a nap and, upon picking her up, I quickly felt stickiness all over my baby and all over my person. There was a muddy puddle the size of a chicken fried steak on the crib sheet. I was thanking God it didn't get on the pretty bumpers. I would have died! That detoured me into poop cleanup for the next 30 minutes. It was like having my own little going away party for the breastmilk poop. See? God really is in the details of our lives, y'all. We had a fairly low-key weekend that ended with a bang. On Friday evening we had a little family outing to the mall. Jackson had suddenly outgrown almost all of his shoes and, propriety aside, the pavement is just too hot to run barefoot around town. We bought him some navy blue Crocs for the third summer in a row. They came with some special markers that he can decorate his shoes with. Maybe I will be a cool mom and let him do it. I mean, let's face it, it's not like you can wear Crocs and maintain your fashion sense anyway. Tennis shoes were also on the list but we didn't find any we loved. I may just buy him the same Vans from last year. I think they look great with all his clothes and they have Velcro, which I'm not ready to part with. When does a kid learn to tie his shoes, anyway? I'm still scarred from potty training and am really not ready to attempt that. According to the magical foot measuring fairy, Jackson's feet have gotten too wide for his current shoes, not too long. Stink. 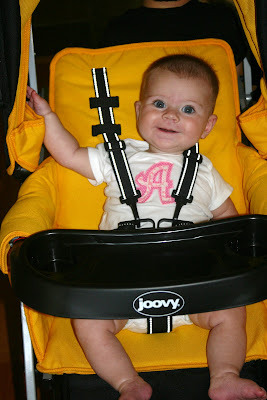 That night we used our Joovy Caboose stroller for the first time. 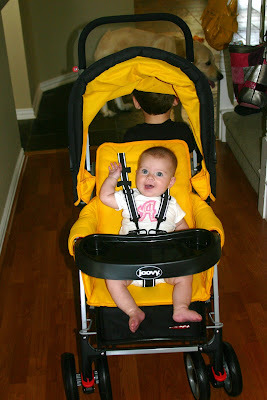 It has a place for Annabeth's infant carrier and a place for Jackson to either sit or stand. He hasn't ridden in a stroller since he threw a hundred and one fits about it last summer, but he was okay with this one. We'll see how long it takes for the novelty to wear off. We drew lots of stares. 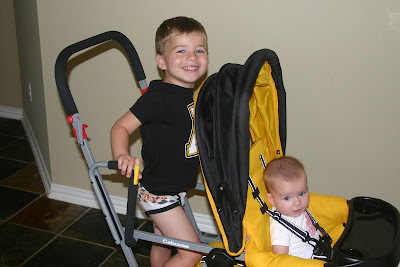 I don't know if it was because the stroller looked weird or because my children are just so lovely and well behaved! 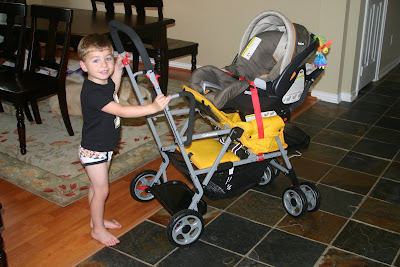 This is how the stroller looks with the infant carrier in it. I didn't know it could do that, otherwise I would have used it a lot sooner. Also, mom said I can't show any more pictures of Sir in his unders or he'll be mad at me later. This is the last time I guess. I've had some questions about that t-shirt. Someone from Boone, NC, gave it to my mom for Jackson. We had a lazy Saturday morning. Curtis worked on the guest room closet and I worked on a little art project. I've made such good use of my craft table lately! Later I tried to take Jackson to the neighborhood pool. When we got there at noon, the place was empty except for the lifeguards who seemed to be cleaning the pool. I didn't bother getting us out and asking; it was totally closed. Someone must have pooped in the water. I feel bad for that someones mom. I hated to disappoint my kid and I'd already sacrificed our cleanliness to the sunscreen, so I called up my grandpa and asked if we could swim in his neighborhood pool. Pappaw was so generous to meet us there and get us in. He actually stayed with us the entire time and we loved getting to spend that time with him. Jackson was happy to have a new and exciting pool to swim in. This pool was actually in the neighborhood where I grew up. I think the last time I swam there I was in 8th grade. Of course my sentimental self relished being there again, even though the pool had seen better days. There were two teenage girls talking to the male lifeguard the whole time. Not only did I feel annoyed that they were distracting him from watching my kid (hello, old woman), but I felt embarrassed for them that they were probably annoying him to death and had no clue. That also made me feel nostalgic because my friend Erin and I spent untold hours annoying the lifeguards in our junior high glory days. That night we went to see Travis Cottrell's concert at a local church. I don't think I need to tell you that we loved it. 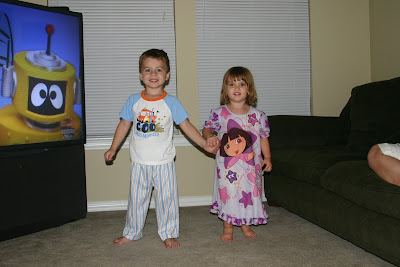 Annabeth wore the special blue dress that the Cottrells gave her so she'd be so pretty when she met Travis and the praise team. She was a little scared of Travis but she went right to Nate. So funny! Yesterday was church and then lunch at my parents' house. Mom cooked a roast and it was the best meal since the last time she cooked it. She makes some mean gravy. While we were there I found a decorative box where I stashed a bunch of keepsakes from when I was 18 and 19. I found a handful of letters and cards from my mom, cards from all my friends for my 18th birthday, and tons of embarrassing pictures. When I was 19 I had an awful, horrible, no good, very bad haircut. Seriously. And braces! My word, the braces! In all the pictures I'm trying to smile without showing them and it just wasn't cute. Bless my heart. Maybe that was God's judgment against me for all the sins of my 18th year. The best thing I found in the box was a birthday card from my Nanny, who passed away less than a year later. By that point Nanny knew she was dying, so what she wrote was long and heartfelt. I'm tearing up right now. I'm so thankful I saved it. I feel like I had a little conversation with her after 11 years. The rest of the day was uneventful until a big storm came through the area at about 7. The thunder and lightning was so crazy it made our windows shake. (This was our "ending with a bang.") Our electricity went out until 10. We were bored and Jackson couldn't sleep because of the silence. He has been trained since birth to sleep with a fan. I've purposely not used one in Annabeth's room yet for this very reason. Curtis and I had such a good conversation while the lights were out that it felt like date night. I'm thinking maybe we need to shut down the computers in the evenings again. Holy cow, I almost forgot the craziest part of the weekend. I had to take a pregnancy test. It was negative. *Hallelujah chorus* My hormones are totally wacky right now, which may be why I was in a melancholy stupor for two weeks. I had to take a test at this exact point after having Jackson. I'd had nausea and everything! So had Janelle. I remember actually getting two tests in one box and taking one to her at the church. Ha ha! That is friendship! I've been wondering if I would freak out at five months again and sure enough I did. One last thing. I'd like to announce that a row of very short baby bangs have begun to make an appearance on my noggin. Enjoy your Monday. 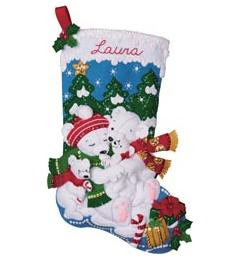 I've been searching online for the perfect Christmas stocking for Annabeth. I know that sounds insane because it's July, but if I'm going to get a good one it has to be way before the holidays start. 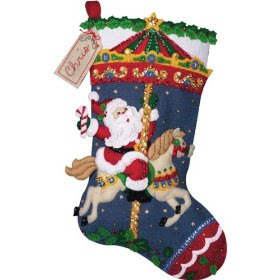 Growing up, everyone in my family had a Bucilla felt, sequined stocking. They're still beautiful after almost 30 years. When I realized they still made them, I was excited to get some for my own family. I bought the kits and quickly realized that pigs would fly before I would ever be able to make them myself. I wasn't that crazy for thinking I could teach myself because my mom made all of ours and she's not exactly a seamstress. Oh well. 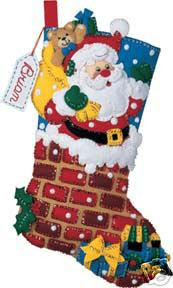 Maybe she was great at sewing back in the day and just totally burned out after making our stockings. (She used to glue gun my brownie patches.) 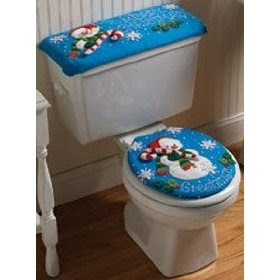 An awesome blog reader named Cinde ended up sewing them for us. I will thank God for her for the rest of my life until I'm either too blind to see them or too senile to remember them. This is Jackson's. His is exceptionally fabulous. Melissa was always bitter that mine was cuter than hers, so I have to pick one for Annabeth that is also fabulous. I'm not sure any of the ones I've seen this year equal his. I could wait and see what they have next year, but you know it will drive me crazy not to have one for her first Christmas. 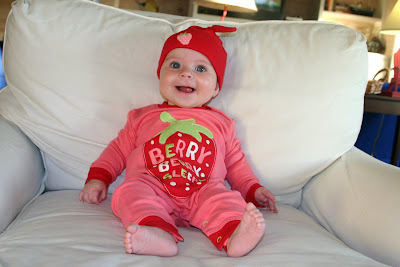 These are the ones I like for Annabeth. 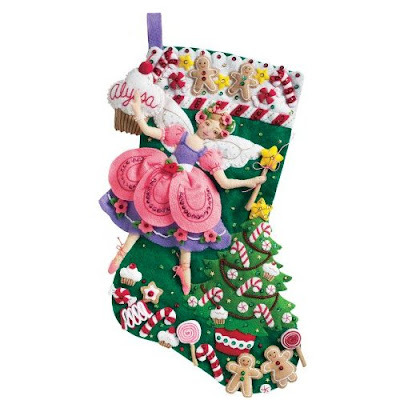 This is the Sugarplum Fairy stocking. I think the pink struggles, but she might really like the fairy and all the Christmas candies and desserts. If I put it to the side of mine, which has a tiny amount of pink, it might not be awful. 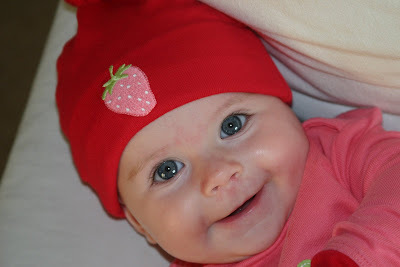 I would be willing to overlook the clashing colors for the happiness of my daughter. 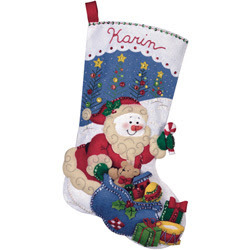 This is Snowman Santa stocking. The benefit of this one is that her name would fit easily across the top. If she grows up loving horses, this could be a big winner. There are a ton of finished ones on Etsy and Ebay, but these three are my current favorites. Which one do you think I should pick? I came across this masterpiece during my search and I was almost inspired to do another giveaway. I decided against it just because I don't want to cause all the losers to stumble in their covetousness. You're welcome. Y'all, I'm in a blogging funk. I've been rather melancholy lately, so that's probably why. Here's what we've been up to this week. I took Jackson to see the VBS show at a church in another part of town. If Disney did VBS, this is what it would be like. Jackson has a DVD that was made from last year's VBS and he loves it, so I thought he's enjoy seeing it in person. Some of the characters and songs are the same. Our friend Steve plays the Commissioner and when he came out in his costume to greet us before the show, Jackson was in awe and hid behind my legs. The rest of the day was filled with swim lessons, aerobics, and grocery shopping. That night I had the Me Myself & Lies study with some girls from Sunday school while Curt took Jackson to see an Astro's game. I hated missing the game with them, but the study has been great. I was really behind and had to do four days of homework before our meeting. Annabeth hung out with Mom and her college roommate. The kids and I had a swim playdate at a friend's pool that morning. That was really great. 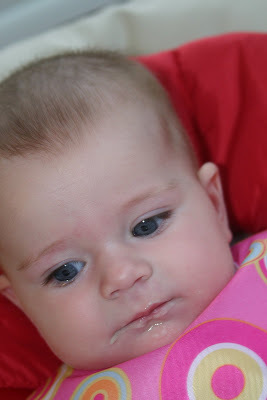 Annbeth had been super fussy for 48 hours with teething and we ended up having to leave early. Jackson even said, "Mommy, Annabeth is fuzzy." A minute later he got in trouble and then he told me he was fuzzy. That night I cooked chicken spaghetti while Curtis took Jackson to swim lessons. The recipe called for cream of chicken soup and I didn't have any, so I made it from flour, milk, butter, and chicken bullion. It made it so good. I wish I didn't know how much butter was in the creamy sauce. This morning we went back to the VBS show and Curt came along. Jackson held his hands over his ears for most of it. He doesn't like the power pirates (the bad guys). Then we had lunch at Clay's. For some reason our waitress brought us free ice cream cake. Score! That's a great family place if you're in Houston. I worked for the rest of the afternoon while the kids slept and now we're getting ready for Metro. Only three left! This past weekend some of my college friends got together for a very short, spontaneous, mini college reunion. What was so ironic was that we couldn't have planned it if we'd tried! Missy came down from Maryland for the first time with 5-week-old Nate. 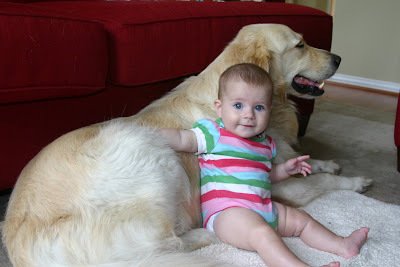 Maggie also happened to be in town from California with 6-month-old Lucy, whom we had never met. 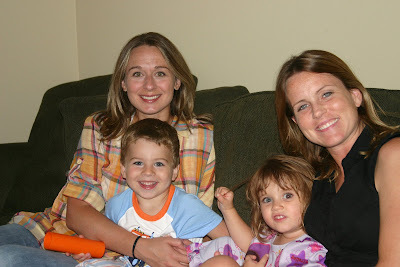 Wanting to meet the babies, Mel drove down from Dallas with 2-year-old Brynne. We got together for about an hour and talked up a storm. It was such a treat! 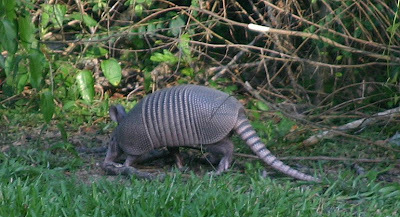 As we were leaving, we saw an armadillo in the yard. Missy's dad half-jokingly asked me if I had a shovel. He was tired of it digging up the yard. There was also a very young, dirty, stray kitten running around who kept jumping in our cars as we were trying to get the kids loaded. When I got in my car it smelled like cat poop. Hooray for all the wildlife. Mel and Brynne spent the night with us, so we had a little longer to hang out. 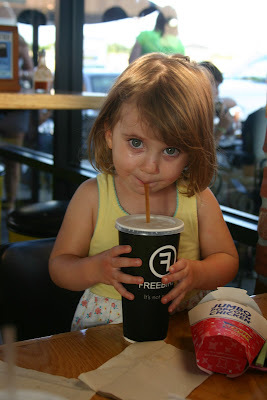 Like good little Aggies, we went to Freebird's on the way home. For some reason it wasn't very good that day, but the company made up for it. When we sat down with our food, I asked Mel if I could bless it. She hesitantly said yes, but I thought nothing of it. I started praying. 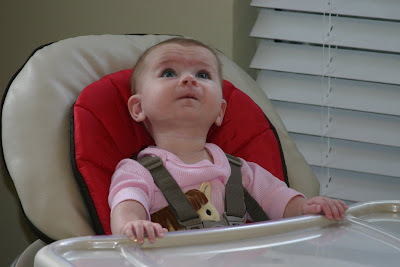 Then Brynne started shrieking like someone was stealing her candy. I looked up at the red-faced, shaking, screaming toddler across the table, unable to imagine what was wrong. It was me. I had not let her pray first! And I hadn't folded my hands right! This was one of the funniest moments of my life. Not so funny for Mel, who spent two minutes trying to console her sweet girl before handing over her Coke. When we got home to Curtis and Jackson, there was lots more fun to be had. The last meeting between Brynne and Jackson did not go so well. They had both been in a stage of not being able to share, but this time they were bff's. Two spirited peas in a pod. They both found a friend who could keep up with their energy. 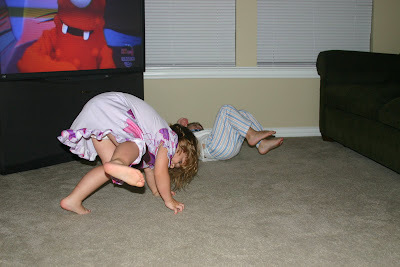 Here they are breakdancing during Yo Gabba Gabba. Mel was encouraged when she saw Annabeth's laid back personality. 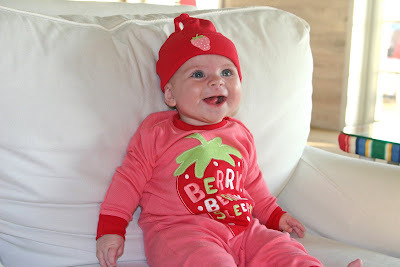 It is possible for one high energy and one chilled out child to come from the same parents. Our guest room is currently out of commission because Curtis is turning the attic closet inside it into a regular closet. Mel stayed with me in my room, which made it more like a slumber party. We didn't turn in until 1 a.m., and even then we laid in bed and talked for another 30 minutes. We were like zombies in the morning, but some donuts and tea helped. Shipley's was having a very good kolache day. Perhaps the best ever. Our guests had to leave early. 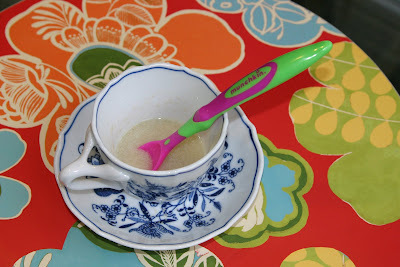 It was a very quick visit but so delightfully unexpected, so easy, and so fun. 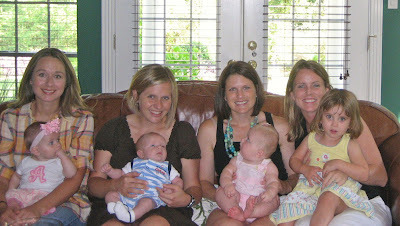 Bonny, we missed you and we're looking forward to a roomie reunion this fall when we can celebrate our big birthdays! Recently some friends and I got to talking about forgiveness. A couple of them had been through some extremely tough trials as a result of another person's sin. Forgiveness, whether offered or declined, would be a major theme in their lives. That conversation made me think about my life and how I've never had to forgive an offense that great. In fact, I've been struggling to forgive something so very small and ridiculous in comparison. Every day for the last four months I've mentally punished someone for wronging me. It happens every day during this exact time - when my kids are asleep and the house is still and quiet. I jump in the shower or bathtub to get clean, but ironically my thoughts turn to mud. I become mentally consumed with how this person has not done what they said they'd do. I consider all the things I could say to them to make them feel bad enough to come through for me. I invent passive aggressive threats that might do the trick. It has been exhausting. Any kind of mental bombardment just takes away your joy. Do you want to know what this whole pathetic emotional hoopla was about? At the very end of November, 2008, I emailed someone about painting canvas letters for Annabeth's nursery. I don't know her, but I'd ordered letters from her for Jackson's nursery back in 2006 and I loved them. I heard back from her in early December and we got the details squared away. She requested payment in early January and I promptly paid. I knew the process would take 10 weeks, but I was prepared to wait. They were worth it! If I counted from my first contact with her, they would arrive in early February. If I counted from when she requested payment, they would arrived mid-March. Long story short, they still haven't arrived. Supposedly they were shipped to the address where we lived two homes ago (in Irving). Whoever lives there now accepted the delivery, so there was no getting the package back. The letters were supposedly then repainted and sent to me again. Only they never arrived. I've had no tracking number, very limited communication by email, excuses, changing stories, and nothing that would allow me to take matters into my own hands and figure out how to get my package. I've said so many prayers about those letters. I've even tried to figure out how to make God send them to me. For example, I remembered that I should pray for my "enemies." So I prayed for this woman. God knows my heart though. I tried to be sincere, but instead of being truly concerned for her, I really just wanted to manipulate God into giving me my stuff. I have driven myself nuts this whole year. Every single day I've thought, "Maybe they'll come today!" or "Maybe I'll have the letters up and the nursery finished by the time _______." Fill in the blank. The baby's born? Nope. The in-laws visit? Nope. All my friends come to see the baby throughout the spring? Nope. Kelly's Korner has the Tour of Nurseries? Nope. In-laws visit again? Nope. I host bunko? Nope. I've had to accept that they're not ever coming. And by "accept" I mean that I told the artist that if I didn't have a refund or a tracking number by such-and-such date, I would contact PayPal for my refund. After waiting a week longer than I stated in my threat, I was finally done with the polite, but direct emails and ready to take action. I issued a claim with PayPal. I felt empowered. I was exacting justice! Immediately after I hit send, I got a notice from PayPal stating that nothing could be done for me. The deadline for that had passed after 40 days of the financial transaction. Awesome. My threats had been empty. I'd had no power all along. I was deflated, defeated, and mad. That night I met with my friends and we had that whole conversation about forgiveness - major life forgiveness. This question came to my mind: If I cannot forgive this woman and just move on...If I cannot let her off the hook for the $111 and all the emotional letdown...If I cannot be wise enough to see that this anger is only hurting me and not doing a single thing to her...how can I expect that I will ever be able to forgive someone for really hurting me or someone I love? What is more, if I know that Jesus Christ has forgiven me for the disgusting, filthy, depraved sin that once made me his enemy, how can I really hold on to this grudge? Over canvas letters? Really, Amanda? I resolved that I would write to the woman and tell her that while I'm disappointed that I never got my letters, I was going to drop the whole thing. I wouldn't ask for a refund. I wouldn't try to punish her emotionally. I would forgive her and move on. Not only to bless her, but to set myself free! Sweet, sweet freedom from these stupid, tormenting thoughts! I might lose $111, but I would gain rich blessings for my soul. I would extend grace, just as Christ has extended it to me. He paid oh so dearly to do it. I opened up my computer to draft the email and what do you think happened? There was an email from the seller. My PayPal claim had gone through after all. Subject line: YOU HAVE YOUR MONEY! Do you think I felt better? Do you think I had peace and joy? Do you think I felt like I had showered and bathed in the beautiful grace and mercy of Jesus? Do you think I felt noble? Do you think I clapped my hands or pumped my fist in the air? I had every right to do what I did. But there had been a more excellent way. And I didn't take it. Now I have $111 sitting in my PayPal account. I honestly have no idea how to use it or even what to spend it on. Whatever it is will have come at a price. I had a chance to cloak myself in my Savior's beauty and be gracious and forgiving - a chance I didn't take. It's been a week and by now I've let the whole thing fall off my shoulders. I'm no longer carrying the burden, one way or another. It's over and God has truly let me release it. But I will not forget this experience. When we flew home from Orlando I said, "Curtis, I swear to you that as long as I live I will never fly alone with the kids." But I cannot imagine two days of driving. We will stay in Wyoming for two weeks. We won't have to pay for lodging or a car and we don't have to take vacation days. Curtis and I will both work from there. What would you do? Would you rather be very bored for two days or very stressed for one day? Tonight didn't go so well. It turns out that when you have a baby strapped to your chest and your 3-year-old in the same class with you, you're about as useful as a goldfish. And as frustrated as a...I dunno. Something really frustrated. I've decided to stay home with the kids and let Curtis represent the Jones family. I'm feeling bummed and very humbled. On Thursday night I'll get to go to a special Houston Project Metro with Curtis. My parents are keeping both kids, so that will be great. I'm going to bed now and plan to wake up and speak truth to myself - I am not a failure just because I bit off more than I could chew. Along with my toast and tea I'll welcome a heaping portion of his new mercies. We tried really hard to have a calm, cool and collected weekend so that we'd be ready to do the *Houston Project this week. On Friday afternoon I ventured to the pool with my two darling angels. It was my first time to take them totally alone without any friends meeting me there. I kept one hand on Annabeth in her float and the other outreached to my little guppy who swam back and forth from me to the steps the whole time. He tends to run away from me in the kiddie area, so I found that staying away from it works better when Annabeth is with us. We ended up leaving after an hour because Jackson didn't want to obey. It always stinks when you have to do something like that, especially when you yourself weren't done having fun. We aren't doing so well with following directions right now and are having to work hard on it. Friday night we did nothing. Curtis and I hadn't had one night at home together all week, so it was nice. On Saturday morning we went to Keegan's birthday party at an awesome McDonald's in Spring (Gleannloch Farms area). It was the neatest McDonald's I've ever been in. Last year at Keegan's birthday party I was so miserable with morning sickness and I remember Jackson having a meltdown about not getting to open presents with Keegan. We had to leave early over it. This year, as a three-year-old, he handled the presents just fine. He did talk about his birthday over and over though. Hey...whatever works. I thought I was going to have something very crazy to blog about but it ended up being fine. Which is preferable! Jackson was at the very top of the three-level playland when he began yelling down at me, "Mommy! Come up here!" I love him so much, but I was not about to climb up there. I noticed that he was doing the I-have-to-potty-dance and hitting the front of his britches with his hands. I immediately started sweating and saying, "Come down right now! Go down the slide and come down!" Did he obey? Yeah right. I think he was freaked out that there wasn't a quick exit. Curtis was in the bathroom changing Annabeth (bonus points for Hubs), so I was left to deal on my own. Basically, I nearly had a panic attack while I envisioned my child soiling the entire play place at my friend's kid's birthday party and being humiliated in front of her friends and family. Luckily, Curtis came back in time and took one for Team Jones. He climbed up there to retrieve our son who, when faced with the potty, suddenly didn't need to go. Seriously? I don't know what all that was about. 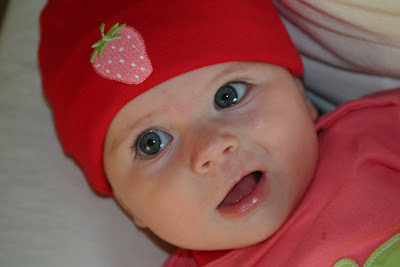 Later that afternoon I left Annabeth with Curtis and took Jacks to the pool again. We really needed a little mommy/son date. Somehow our Galveston trip had disturbed our connection. The two of us had a great time swimming. An energetic little boy is not so fun at restaurants but lots of fun at the pool. By the way, I keep hearing mommies talk about how fun the library is, but that honestly sounds like torture to me. 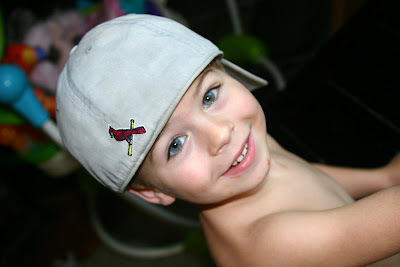 Maybe that works with a different kind of kid, but I cannot imagine my Tasmanian angel doing well in there. If you have a very busy and loud three-year-old boy and he can calmly enjoy the library and you think I should try it, let me know. Curtis spoke to some youth who were in town for the Houston Project from late afternoon until that night, so I got the kids to bed and just vegged. 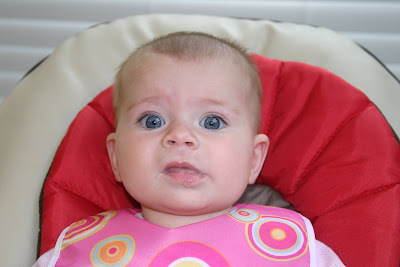 Annabeth had a really hard time going down, which makes me think the whole teething process is starting for her. On Sunday morning we worked in the preschool department at church. We were with two-year-olds this time. They were not as much work at the 18-month-olds we had last time. (I think that is a really hard age to parent, in case I haven't ever said that before.) We were cracking up because the kids were all over Curtis. We thought maybe they don't have male volunteers in there very often. Just like last time, I wasn't real sure how to play with the little girls at first. 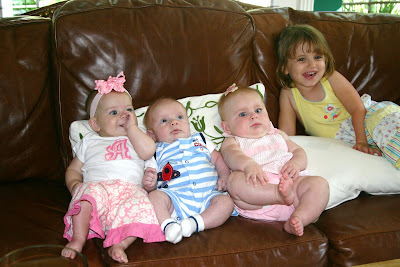 What cracks me up is that they all wanted to play with the baby dolls and they held them like they were real. I don't think I ever did that! I had an ET doll that I dragged around by the arm and my Nanny had to sew it back on for me multiple times. We left when the kids' regular teachers arrived after the first service. They were two beautiful, senior saints. All the children ran up to them and gave them hugs. Curtis was like chopped liver at that point. It was precious to see how the children loved those sweet ladies. Pastor Gregg talked briefly about retirement in his sermon and he said that retirement is a break from daily responsibility and stress, but it is not a break from purpose. He mentioned that our church benefits from countless hours of service from retirees, and I hope that will be me when I'm in my senior years. After church we drove out to Kelly Village, which is the housing development where we will be serving this week. We got to meet the other volunteers from our church and get the site ready for VBS, women's and youth ministry activities. We also hosted a block party with mimes, bounce houses, snow cones, pizza, games, face painting, and crafts. We were able to let the neighbors know that we would be there in the evenings this week. Curtis and I were assigned to work the bounce house for little kids. That worked out well since we had Jackson with us and he could just stay in that thing the whole time. Annabeth and I sat in a tiny bit of shade from the bounce house and I tried to keep her happy. She wasn't digging the heat. Another volunteer brought me a cup of snow cone ice without the syrup and I decided to try to spoon it in her mouth. 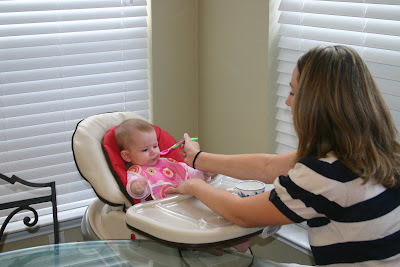 Forget about having everything 100% perfect for her first experience with a spoon and solids. 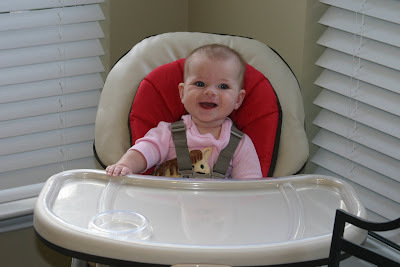 There wasn't a cute highchair, there was no regular camera, much less a video camera. There was just a mama with a red faced, crying, sweaty baby who was desperate to cool her off. Well, she didn't hate it; she actually did pretty well. She spit out about half of each spoonful, but I know she got the rest down. She was quick to let me know when she'd had enough of a big plastic spoon shoved in her mouth, but it definitely helped her cool off. We left there between 4 and 5 and headed home. We were sweaty and smelly, but glad we went. We'll head back there late this afternoon. For the next few days, Jackson and I will be in the VBS room with 3-5 year-olds and Curtis will be with middle school kids. Tonight Annabeth will be with me - on my person, in fact, in the Baby Bjorn - but hopefully later in the week she'll hang out with my parents. If we should cross your mind this week, please pray for us. We're so thrilled to get to serve in this way. 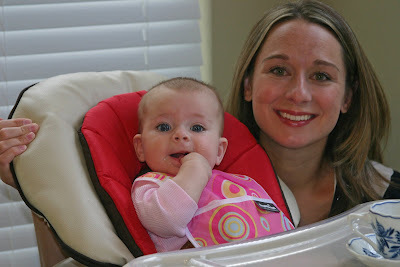 At the same time, having a nursing baby makes things a little more complicated. I can't wrap my mind around how exactly it's going to work, but I'm trusting God. Please pray that we serve Jesus and serve this community with lots of love and joy. Thank you so, so much! When Curtis and I met as missions interns back in 2000, the Houston Project was what we did all summer. He has been involved through speaking almost every summer, but this is my first time to have a role since we were interns. It feels like coming home again. And with kids! 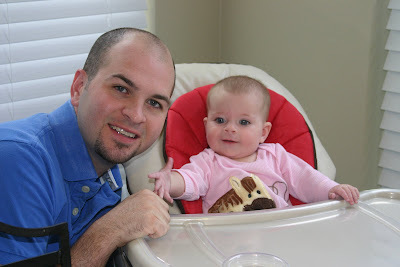 **The slideshow of Annabeth and Curtis is finally off the main page of my blog. So if you've been avoiding it because of the loud music, you can come back now. Sorry, y'all! I took these last week while we were in Galveston. 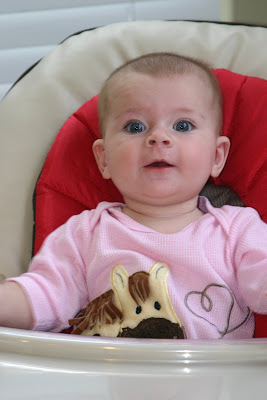 It was the day she turned 5 months old, but I didn't have the bear with me. I found the pajamas at a shop on The Strand. 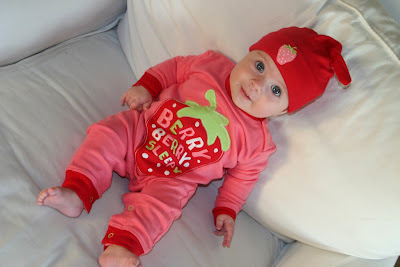 They also had a similar onesie and a bathing suit. Soooo darling.